Love this card! That background paper is really cool! It mimics a stamp. Hey sweet Pryn(cess)! Thanks for the love you left me over on my blog! We have got to get together soon for a weekend visit! Love your card too, but I always love your creations! You make me smile! Big hugs! 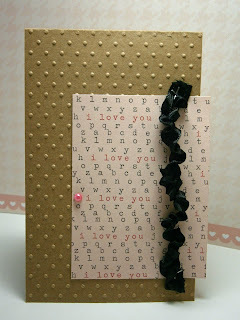 Very fun and fabulous no stamping card!!! Very creative. LOVE the type panel and fabulous ruffled ribbon!! It's so hard going back to digi-less cards and you rocked it! Thanks for following me and leaving me a sweet comment on my blog today - you really made me smile! I'm following you now !! Fun, fun, fun card!! I love it! Happy to be following you now! Stop by my last post...I mentioned you! I love this card Pryn! I enjoyed looking at your blog too.